NEW YORK -- More than 2 million patio chairs sold exclusively at Home Depot over the last 10 years are being recalled due to a fall hazard. 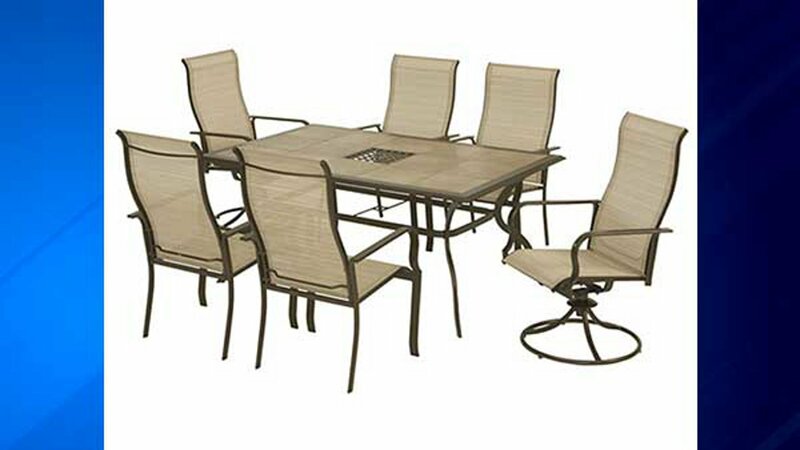 The U.S. Consumer Product Safety Commission said the base of the swivel patio chairs can break during normal use, resulting primarily in bruises and scrapes from falls. Manufacturer Casual Living Worldwide Inc. said it has received 614 reports of chairs breaking in the United States, resulting in 25 reports of injuries. The CPSC said the chairs were sold at Home Depot stores nationwide and HomeDepot.com from January 2007 to February 2016. In addition to 2 million units that were sold in the United States, about 30,000 units were sold in Canada and about 14,000 units were sold in Mexico. According to the CPSC, the recall involves Hampton Bay Anselmo, Calabria, and Dana Point chairs as well as Martha Stewart Living branded Cardona, Grand Bank and Wellington swivel patio chairs. The chairs are made of aluminum and steel with a round swivel base and arm rests. The chairs were sold as a pair and as part of a seven-piece patio set with accompanying tables. Consumers may contact Casual Living Worldwide toll-free at 855-899-2127 from 8 a.m. to 5 p.m. ET on Monday through Friday or online at CasualLivingOutdoors.com and click on "Recall Information" for more information.